Juice It Up!, one of the nation’s leading raw juice bar and hand-crafted smoothie chains, is excited to introduce Tasty Treat Combos featuring three new, kid-friendly smoothies paired with a bag of chips or pretzel bites, along with a glow in the dark wrist band. Designed with kids in mind, the three new smoothies, served in 12 oz. portions, are both dairy and gluten free. 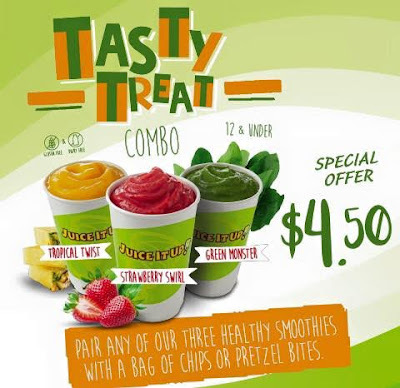 Ideal for an after-school snack or a boost before any sports practice, all three new Tasty Treat smoothies fulfill nearly two servings of fruits, while the Green Monster Smoothie also features a full serving of veggies. The refreshing new smoothie options are dairy, gluten, fat and cholesterol free, and are an excellent source of Vitamin C and fiber. Available for a limited time to guests 12 and under, the Tasty Treat Combos will be featured on Juice It Up!’s menu alongside fresh-squeezed functional raw juices, blended-to-order real fruit and veggie smoothies, and nutrient-rich bowls loaded with superfruits Açaí and Pitaya. To supercharge any bowl or smoothie, guests can ask to “Make it Green” by blending in raw kale and spinach to add an extra dose of fiber, vitamins and minerals. For the full menu and complete nutritional information, visit www.juiceitup.com. Check back for review and Giveaway! Happy Back To School Busy Life!